This combo course gives you the chance to complete the PADI Open Water Diver as well as the PADI Advanced Open Water Diver, at one stretch. The 7-day course begins with a study of theory modules and practical training in shallow water. By the end of the course, you'll have completed nine open water dives in the Andaman Sea, swimming down to a maximum depth of 100 feet. At every step of the course, you'll be guided and trained by a certified dive instructor, who will teach you the basic as well as advanced skills in scuba diving. The gorgeous coral reefs of the Andaman Sea, teeming with brightly-coloured marine life, make for the perfect dive spots for your combo course. This combo course takes you diving around Havelock Island, home to some of the best dive spots in India. With crystal clean water, these dive spots feature relatively high underwater visibility and a wide diversity of marine life. An absolute paradise for scuba divers, the dive spots offer unmatched views of sprawling and stunning coral reefs. They are perfectly complimented by the teal-blue waters of the ocean and the brightly-coloured, diverse species of fishes all around. Apart from diving, you can also relax at one of Havelock's soft and sandy beaches with the tropical vibes of a green forest. • Earn your PADI Open Water and PADI Advanced Open Water certificate. • Go scuba diving in the azure waters of Havelock Island. 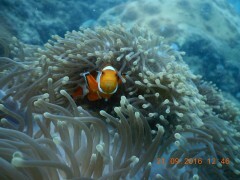 • Dive to a depth of 100 feet to see stunning coral reefs and fishes. 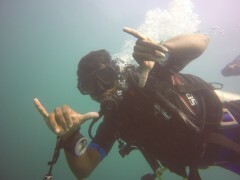 • Complete nine open water dives in the Andaman Sea. Travellers are required to follow instructions of the dive instructor during the PADI OWD+AOWD combo course in Andamans. Consumption of alcohol and drugs is strictly prohibited during the course. Consumption of tobacco products and cigarettes is not recommended. Please allow 12 hours between the end of your last dive and your return flight to allow your body to recover. For cancellations made 30 days or more before beginning the Andamans PADI OWD+AOWD combo course: 98% refund. For cancellations made 15-29 days before beginning the Andamans PADI OWD+AOWD combo course: 50% refund. For cancellations made less than 15 days before beginning the Andamans PADI OWD+AOWD combo course: no refund. All refunds will be processed after deducting a transaction charge of INR 200 per person. This fee is charged by The Great Next. Travellers are required to pass a 650 feet swimming test and 10 minute floating test before beginning the course. Travellers are required to complete a medical questionnaire, sent to you after confirmation of the booking. Based on the answers to the questionnaire, you may be required to obtain documented doctor's clearance allowing you to engage in scuba diving. Travellers must agree to discontinue scuba diving if respiratory congestion, a head cold or any other medical condition occurs during the course. The tour operator reserves the right to alter or cancel the itinerary of this PADI OWD+AOWD combo course in Andamans due to bad weather conditions to ensure maximum safety of divers and staff. No pick-up for this PADI OWD+AOWD combo course. No drop-off for this PADI OWD+AOWD combo course. Arrive at the dive center by early morning. Here, you'll meet your dive instructor and begin training for the first part of your combo course - the PADI Open Water Diver. The course begins with theory modules covering the use of scuba equipment, proper dive technique and navigation methods. Each module has a corresponding confined water training session, where you'll work with your dive instructor in shallow water to practice your skills and demonstrate your knowledge. Your training for the day ends by evening. You can spend the rest of the day at leisure. Learn the basic and advanced skills of diving with a combo course! You'll follow the same itinerary as yesterday. Arrive at the dive center by early morning and cover the remaining sections of the theory. You'll upgrade to covering a few of the more detailed and intricate scuba skills. The training continues in shallow water, as you get more and more comfortable with the scuba equipment. Your training for the day ends by evening. You can spend the rest of the day at leisure. Day 3 of PADI Open Water Diver course: 2 open water dives! It's diving day! By now, you'll have learned and practiced enough scuba diving to be confident for the open ocean. You'll take a boat ride to some of the dive spots around the island and suit up for your open water dives. Working with your dive instructor, you'll complete two open water dives, going down to a maximum depth of 60 feet. Return to the dive center by late afternoon. You can spend the rest of the day at leisure. Day 4 of PADI Open Water Diver course: 2 open water dives! It's diving day! Take a boat ride to some of the dive spots around the island and suit up for your open water dives. Working with your dive instructor, you'll complete two more open water dives, going down to a maximum depth of 60 feet. Return to the dive center by late afternoon and complete the paperwork for your certification, including a short quiz. This completes the first part of your combo course. You can spend the rest of the day at leisure. Day 5 of PADI Advanced Open Water Diver course: 2 open water dives! It's diving day! Arrive at the dive center by early morning. Today, you'll begin training for the second part of your combo course - the PADI Advanced Open Water Diver. After a short refresher of your prior skills, you'll proceed to take a boat ride from the dive center to a few of the dive spots in the Andaman Sea. You'll don the wetsuit to complete two open water dives, going down to a maximum depth of 100 feet. During these dives, the dive instructor will take you through the two mandatory specializations of underwater navigation and deep diving. Your training for the day ends by evening. You can spend the rest of the day at leisure. Day 6 of PADI Advanced Open Water Diver course: 2 open water dives! It's diving day! Arrive at the dive center by early morning. You'll proceed to take a boat ride from the dive center to a few of the dive spots in the Andaman Sea. You'll don the wetsuit to complete two more open water dives, going down to a maximum depth of 100 feet. During these dives, the dive instructor will take you through the two elective dive specializations offered by the dive center like peak performance dive, drift dive or wreck dive. Your training for the day ends by evening. You can spend the rest of the day at leisure. Depending on weather conditions, you may also have the option of completing a night dive in the evening. Day 7 of PADI Advanced Open Water Diver course: 1 open water dive! It's diving day! Arrive at the dive center by early morning. If you were unable to complete a night dive, you'll proceed to take a boat ride from the dive center to a few of the dive spots in the Andaman Sea. You'll don the wetsuit to complete the last open water dive, going down to a maximum depth of 100 feet. During the dive, the dive instructor will work with you to put the finishing touches on your dive technique. Return to the dive center by late afternoon and complete the paperwork for your certification, including a short quiz. This completes the second part of your combo course. Your trip ends here. Begin your training for the PADI Open Water Diver certification by learning theory modules and participating in shallow water training. Today's package does not include any meals. Continue your training for the PADI Open Water Diver certification by learning theory modules and participating in shallow water training. Today's package does not include any meals. 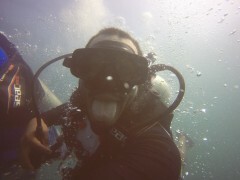 Complete two open water dives in the Andaman Sea. A light lunch will be served on the boat, between the two dives. Begin your training for the PADI Advanced Open Water Diver certification and complete two open water dives in the Andaman Sea. A light lunch will be served on the boat, between the two dives. Complete one open water dives in the Andaman Sea. A light lunch will be served on the boat. The dive center is located a 10-min drive from the Havelock Island jetty, on Beach #3 - Govind Nagar Beach. You can board a flight to Port Blair's Veer Savarkar Airport and take a ferry from Port Blair to Havelock Island. The dive center is accessible via private cab/taxi from the jetty.